Before graduation she secured a position at UN Women with a long-term internship. 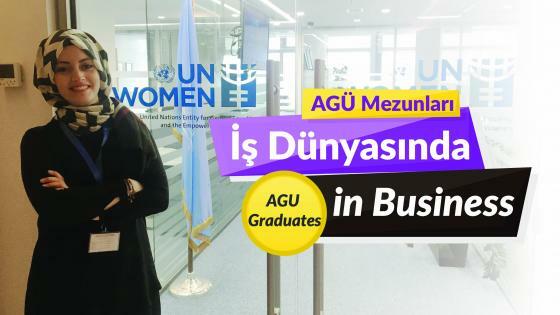 AGU graduates find jobs at international companies and institutions in short periods and İrem Polat became an administrative assistant at the UN even before graduation. Polat was accepted for a long-term internship at UN Women and before her internship was over, she received a job offer. 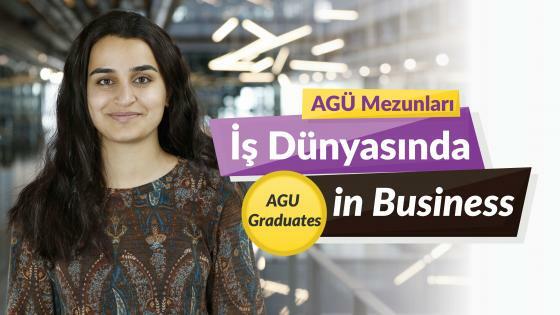 AGU graduates quickly find jobs at the leading companies and institutions in Turkey and the world. One of the first graduates of Industrial Engineering, Buray Türkmen’s job application was accepted by the THY and he started as an income analyst. “My first advice is that they should develop their career plans as early as possible and take steps in that direction. It may take some time for new university students to understand which subfields they are interested in, but an early decision would give them advantages over a last-year’s student who has just set career targets. It is very important to follow current topics, to talk to people from the business world and academia and to see what the market needs are. Students must do related internships, carry out academic studies and even create a tangible product before graduation if they study in a department such as Mechanical Engineering or Electrical and Electronics Engineering. About his future career plans, Türkmen said: "I plan on improving my skills in aviation, adding more value to the company I am working at and continuing my academic studies." 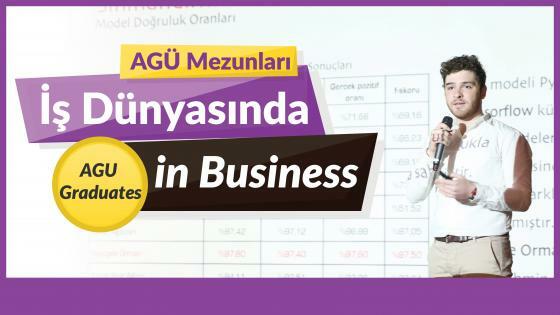 Industrial Engineering graduate Umut Yapır started working as a Business Analyst at ASELSAN. Most of the first graduates of AGU who finished their studies last year found jobs before their last day at the university and many others got a job shortly after. One of the later type of students is Industrial Engineering graduate Umut Yapır. Yapır started his working life within a short time at ASELSAN as a Business Analyst after his job application. Mentioning the quality education at AGU, abroad experience, social skills and a strong network as factors for getting a job in a short time, Umut Yapır also talked about his graduation project carried out in collaboration with ASELSAN and the advantages it provided him. Internships during one’s undergraduate study are indeed valuable. Interns get to discover what they want or what they want to avoid in the future. Students should remember that even a failure is an experience and helpful. Potential graduates should follow necessary examinations if they want an academic career. Recruitments consist of several steps and take some time. As this pre-employment process can be tiring, make some alternative plans and be prepared. A majority of AGU’s first graduates found jobs at interna- tional companies and other institutions in a short period of time. İsmail Berat Farız, one of the graduates of the Civil Engineering department, started his career as a planning engineer within a short span of time after his graduation at the Terminal-2 project for Kuwait International Airport carried out by Limak Holding, an international company. 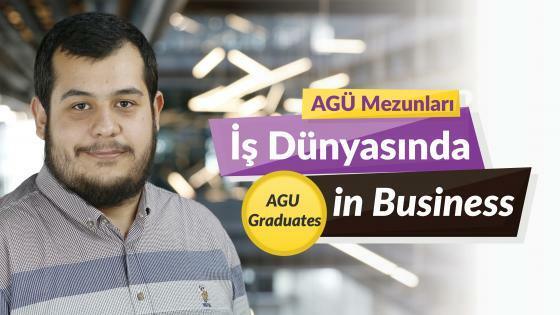 İsmail Berat Farız explained in his interview that he owed his job at an international company to experiences he gained as a student at AGU, projects and internships he did, as well as social and professional events he joined abroad and in Turkey. Farız said he received offers from many companies but he preferred to work abroad and chose the one in Kuwait. He stated that adaptation to business life was not difficult for him thanks to the 100% English education and integrated and collaborative courses. "I must say that the business life is different from the university life, more complex and challenging. I can say with confidence that they should not be afraid of making mistakes, should learn from their mistakes and see every mistake as an experience." Also stressing the importance of having a good command of English, Farız said: "I had a head start on other candidates because I entered into business world as a graduate with a good command of English. Thanks to my English education at AGU, I did not have any troubles at job interviews abroad and could express myself better." AGU students receive job offers before they even graduate. Şükrü Yasin Güven, one of the first graduates from Industrial Engineering, was only one of those who was offered a job before graduating. Güven was offered a job at ASELSAN thanks to his graduation project and started to work there and was quickly promoted to Project Manager. 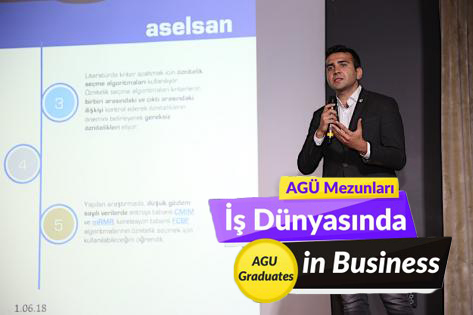 Güven talked to AGÜ News about the privilege of being an AGU graduate and how he got job offers before graduating. "Being an AGU graduate is not only about departmental courses. It also means gaining certain discipline. Therefore, a graduate both knows his or her responsibilities and proves themselves in social areas." "I owe my job at ASELSAN to my highly successful graduation project carried out at the company. While executing the project, company officials expressed their wish to work with me. The process started with an online application and finished after two separate face-to-face meetings. The process lasted almost 3 months." "In business life, being solution-oriented rather than problem, being curious and having strong communication skills ensure a quick socialization and integration into business. I believe, not shying away from making mistakes, knowing how to ask questions and elicit answers are keys to the success in business life. "I benefit from all the experience I gained in social areas, during the project process and from communication skills I developed. I sincerely think that future graduates need to improve themselves in these aspects." Please enter your e-mail address below to follow our university..